3 or 6 delicious tastes. Choose gift boxed or not. 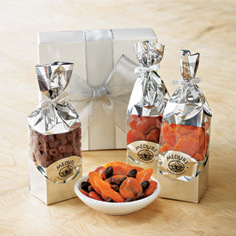 Succulent all natural dried fruits to enjoy and savor. 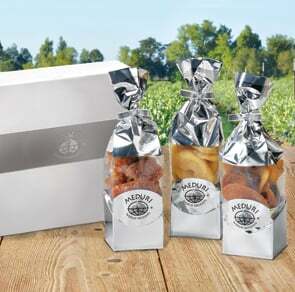 Share with your family, or give the Orchard's Best Three Sampler Set as an elegant gift box. 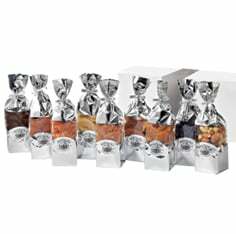 Each all-natural dried fruit flavor is sealed in a gleaming mylar 6oz packet. The Orchard's Best Three-Sampler Set comes with: Delicious Double Red grapefruit slices from Mexico, Cinnamon Fuji Apple Wedges from the Pacific Northwest and our own Marco Polo Mix. 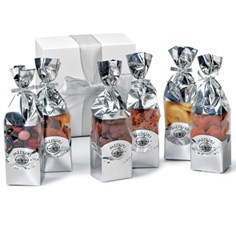 Find the finest unsulphured all-natural dried fruit sampler sets at Meduri World Delights!